Yarn Type Kidsilk Haze Trio is three ends of Rowan's ever popular Kidsilk Haze spun together to make a beautiful soft and lightweight yarn. With a pallet of 4 deep colours and one natural shade (snowberry) Trio offers all the softness of Kidsilk Haze in a heavier yet lightweight yarn. 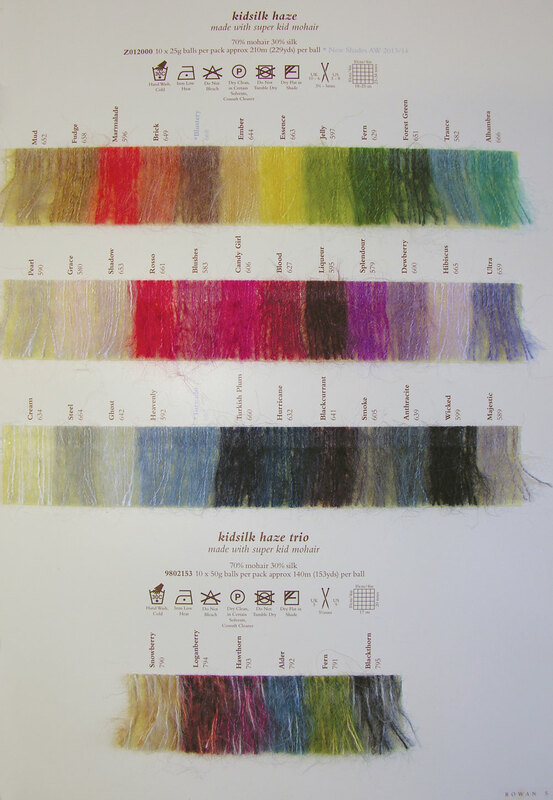 70% super kid mohair 30% silk. Hand wash only. A collection of easy to wear and modern shapes, designed by the Rowan team. All the designs are easy to knit and some of the designs are even achievable by the beginner knitter! The deisgns use Kidilk Haze Trio. This beautiful yarn is made by twisting three of our Kidsilk Haze colours together producing a chunkier yarn with an amazing subtle hazy marl effect.